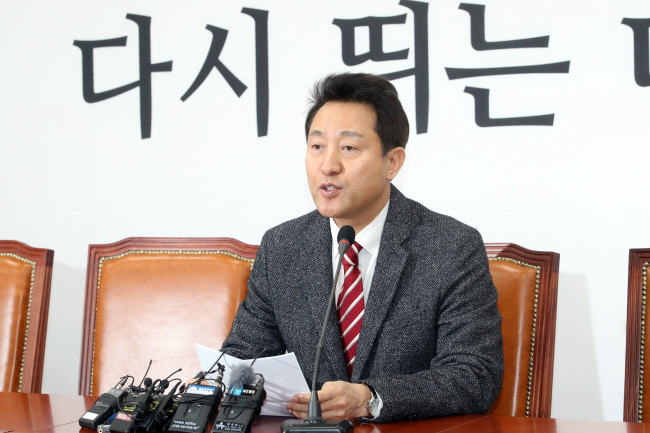 Former Seoul Mayor Oh Se-hoon said Tuesday he will run in the main opposition Liberty Korea Party's leadership election late this month, abandoning his earlier pledge to boycott the event. They called on the party to postpone the election to avoid a clash with the summit between US President Donald Trump and North Korean leader Kim Jong-un to be held from Feb. 27-28 in Hanoi. The party reviewed a possible delay twice, but decided to hold the election as scheduled. 2020 parliamentary elections. But internal strife surrounding the election date postponement and the recent political crisis have dented the party that struggles to muster support from conservative voters.